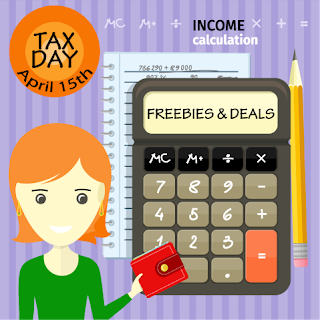 Tax Day is today (April 15th) and lucky for us many businesses like to offer freebies and discounts. Here's a quick list of what we've found so far. *The list is not limited to our area. •Bonefish Grill: CLICK HERE to print a $10 off coupon. Valid now through April 20th. •Boston Market: Buy One Individual Meal and Get One Individual Meal FREE! April 15, 2015 Only! Valid with any Individual Meal, Whole Sandwich, Whole Sandwich Combo, Salad Bowl, or Market Bowl. Limit 3 BOGOs per person, per visit. No coupon required. •Bruegger's Bagels - Big Bagel Bundle $10.40 with this coupon here through April 15th. •Great American Cookies: Free regular sugar cookie on tax day Wednesday, April 15th! *Limit 1 cookie per person at participating locations. •Hard Rock Cafe: Sing your favorite song on stage on Wednesday, APRIL 15, 2014 from 5PM-7PM, you can perform on the stage with the band, The Super5, to earn your free Local Legendary Burger! •Kona Ice: Will have their trucks parked outside post offices, tax preparation centers, and businesses all over the country on April 15! Stop by the truck and you'll get a free cup of shaved ice and a free Hawaiian lei. Search to see where a Kona Ice truck is near you. •Moe's Southwest Grill: Free Burrito with the purchase of another burrito April 14th-19th. •Outback Steakhouse: CLICK HERE to print a coupon for 15% off your entire check through 4/19/15. •Papa Murphy's: Large 1-Topping Fresh Pan Pizza, plus a Large FAVES Pizza, for just $10.40! Offer valid April 15, 2015 only. Fresh Pan in large only. Limit 3 per visit. Show this offer in-store (on your mobile device or printed) to redeem. Not valid with any other offer. Valid at participating US locations only. •Schlotzsky's: Get a FREE small Original sandwich on Wednesday, 4/15 with the purchase of chips and a 32 oz. drink. 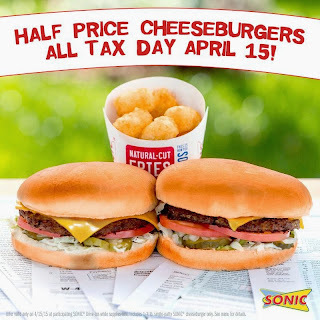 -Sonic: All Day 1/2 Price Cheeseburgers April 15th. •United Supermarkets: Join us for free beans and cornbread from United Supermarkets this Weds, April 15 from 4p-8p. One bowl per guest, dine-in only. •Ace Hardware: $10 Off $40 At acehardware.comOnly with code: TAX15! Plus, Free Store Pickup. Buy Online & Pickup Today At Your Participating Neighborhood Ace! Exclusions Apply. Valid 4/15/2015 only. •Crazy8: Get an extra 15% off plus free shipping with code TREAT. •Designer Living: Take additional 25% off with the code TAXBREAK25. Valid through April 19th. •Hat World/Lids: Take 25% off $25 for Tax Day! Use code SALE25, valid 4/15-4/16. Some exclusions apply. •HydroMassage: Free HydroMassage at participating locations April 13th – 17th. We strongly encourage you to call ahead to be sure that the location will honor this promotion and schedule a time for your free experience. •LivingSocial: Extra 15% off with code TAXBREAK15. 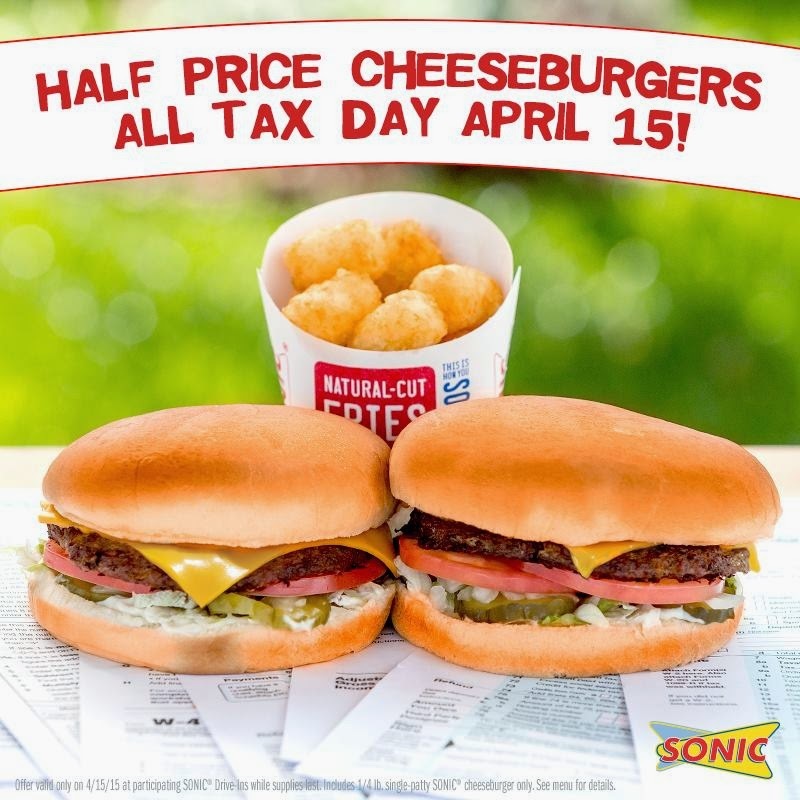 This offer is valid 4/15 12:00am ET through 4/15 11:59pmPT. Max savings $20; Restrictions apply. •Travelocity: Take $75 off Participating Hotels (Min. Spend $350), use PROMO CODE: TAXDAY75. Ends 4/16. If you know of something, please let us know! !